Where I write @ family, life, web design, photography, tech, health and social media. Lack of sleep affects our mood. Lack of sleep affects our health. Lack of sleep affects our productivity. I can only speak for myself. When I don't get enough sleep and I don't feel adequately rested, my mood can swing from pensive to giggly. It definitely alters my productivity. I see a marked difference in my concentration if I have had a good night's sleep. For me, the most important item on the list above is how lack of sleep affects our health. According to Dr. Erica Mallery-Blythe, “sleep loss impairs immune function & immune challenge alters sleep”, so it's a vicious cycle. According to Dr. Mallery-Blythe, sleep deprivation delays wound & burn healing, decreases white blood cell count, and impairs working memory – which, in turn, impairs decision making, reasoning, episodic memory, and lowers seizure thresholds. 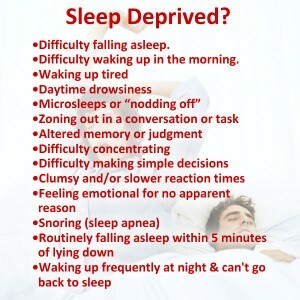 There are many symptoms associated with sleep deprivation, such as: aching muscles, confusion, memory lapses (or loss), depression, hallucinations, hand tremors, headaches, malaise, sensitivity to cold, bloodshot eyes, puffiness around the eyes, increased blood pressure, increased stress hormones, increased risk of diabetes, increased fibromyalgia, irritability, obesity, child temper tantrums, yawning, and some symptoms that are similar to ADHD & Psychosis. And, By the way, complete sleep deprivation leads to death, she says. Recent research at UCLA indicates that there may be a connection between improved lifestyle habits, including improved sleep hygiene, and improved outcomes for Alzheimer's patients. The amount of sleep that each person requires varies. There are folks that swear that they don't need more than 5 hours of sleep per night. Others, like me, need a minimum of 8 hours of good quality sleep in order to feel healthy. Consistently maintain regular bedtime and wake-up hours (even on weekends and holidays). Keep your bedroom dark. Even the slightest glow from an alarm clock can disrupt your ability to sleep. If you don't go to sleep within 20 minutes, get out of bed. Return to bed only if you're sleepy. Avoid caffeine consumption (tea, cola, coffee, chocolate) within 4 hours to 8 hours of bedtime. Exercise regularly, but avoid intense physical activity 3 hours before bedtime. Avoid daytime naps. If you must take a nap, do so before 3 pm. Avoid eating a meal 2 hours before bedtime (a light snack can help avoid hunger pangs and aid sleep). Avoid stressful or noisy distractions while trying to sleep (noisy clocks, bright lights, uncomfortable clothes or bedding). Avoid alcohol consumption & nicotine 2 hours before bedtime, which can disturb sleep quality. Create a relaxing bedtime routine (book, music, bath, relaxation technique). If you have difficulty relaxing at bedtime, essential oils, like lavender or chamomile in a diffuser (or in a bath) might help to soothe you enough to relax. You might also want to utilize some herbal relaxation aids such as valerian, passionflower, hops, or lemon balm may be helpful. Get enough sleep so that you feel well-rested nearly every day. The bedroom should be calming, quiet, dark, and a little bit cool and make sure your bed is warm & comfortable. I urge you to consider avoidance of any electronics in the bedroom – including TVs and cell phones. Last, but not least, my colleague, Rosangel Perez, and I recorded a blog talk radio show called Tips For Better Sleep, which inspired this blog post. You can listen to our recorded show here. Disclaimer: The information contained in this article is provided for informational or educational purposes only and is not intended to be, or serve as a substitute for the advice of your physician. Always seek your doctor's advice. Slow Shutter Cam iPhone 4 app beat my Canon T1i? What is the Glif & why should you care?